David Tobey, son of the late distinguished historical painter, muralist & illustrator Alton S. Tobey (1914-2005) is having a one-man show of his own paintings and sculptures at Pleiades Gallery in New York November 7th through November 25th, 2006 to benefit the National Scholastic Chess Foundation. 100% of proceeds from an auction sale of the painting "Bishop Takes Rook", that he donated to the NSCF will go to the foundation; as well as a full 30% of all other sales of his paintings and sculptures that are in the show, all of which can be seen at a reception at the Gallery Thursday, November 9th from 5:30 to 8:30 P.M. 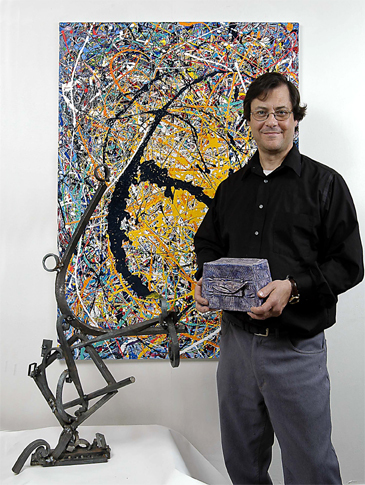 Artist, violinist and teacher David Tobey, son of the late renowned illustrator and muralist Alton S. Tobey (1914-2005), will be showing his paintings and welded steel sculptures in a benefit exhibition for the National Scholastic Chess Foundation (NSCF) at Pleiades Gallery, 530 West 25th Street, New York November 7th through November 25th, 2006. The artist has donated one of his major paintings entitled “Bishop Takes Rook” to the NSCF to be auctioned off with 100% of the proceeds realized to go to the NSCF, as well as 30% of any other sales of his artwork or sculpture to benefit the group as well. The reception for the exhibition will be held at the gallery on Thursday, November 9th from 5:30 to 8:30 p.m.
David Tobey, a lifetime resident of Westchester, started painting in his early childhood in his father’s studio. He also had a serious interest in music, fostered perhaps in no small part by his mother Rosalyn Tobey, who was a distinguished concert pianist. In his teens, David studied art at The Art Students League in New York and violin at The Music Conservatory of Westchester. He subsequently gained admission to The Julliard School of Music and graduated there with a performance degree in 1975. He also holds a Master's degree in Studio Art from The College of New Rochelle, in the city where he currently lives with his family. In addition to being a painter and sculptor, David enjoys a busy career as a violinist and teacher in the New Rochelle school system, and he performs with many New York City freelance orchestras and with Broadway shows. He is also a member of The Westchester Philharmonic. He has appeared on radio and on TV discussing his art. David Tobey describes his work, in his own words as: "exploring the aesthetic between visual abstraction and music ... and exploring energy and rhythm with a strict eye on the structured whole." A 2003 magazine review of his first one-man show in New York City describes his painting: "He rides the rhythms in his canvases and reigns them in, much as a composer controls the ebb and flow of a symphony as it is coaxed into being. As with any piece of music, this involves a synthesis of spontaneity and restraint, as he works and reworks the composition, balancing its various elements until they coalesce in a dynamic chromatic and formal fusion". Tobey's art has been published on the album cover “First Flight” by Oren Fader, on posters at New York's Lincoln Center and his work is in the collection of the George Bush Library. He has published his art as prints with Scafa, Modern Art and Ray Greenberg Art Publishing, and he has had many one-man and group exhibitions in the greater New York metro area, Westchester and Connecticut. This is his second one-man show in New York City. More information on Pleiades gallery can be found on their web site at http://www.pleiadesgallery.com. The National Scholastic Chess Foundation is a not-for-profit 501(c)(3) organization established in 1993 to bring the benefits of a chess education to students of all ages. 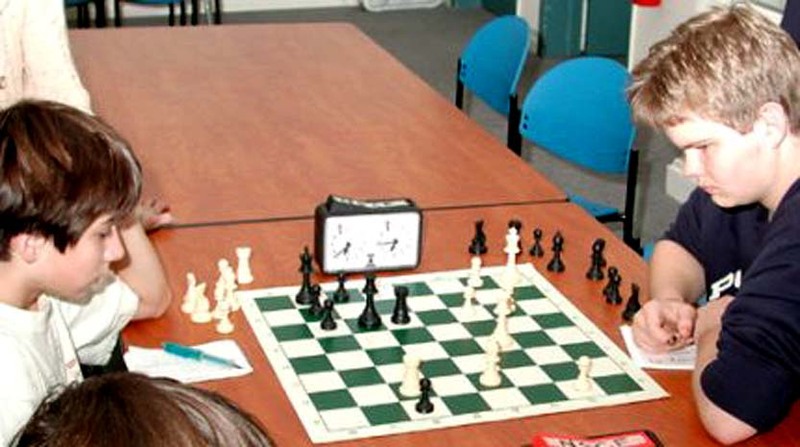 The NSCF promotes the study of chess and enrichment programs within schools and the community, and provides a forum for exploring innovative teaching techniques in an effort to improve chess instruction in the classroom. Above all, the NSCF aspires to meet its social responsibility by supporting chess programs that serve children in financial need. More information on the NSCF can be found on their web site at http://www.nscfchess.org. At the Tobey reception at Pleiades Gallery on November 9th, the public can meet the artist as well as members of the NSCF. Young competitors from the New Rochelle, NY Isaac Young Middle School Chess Team will also be at the reception, and will display their skill and talents as they challenge visitors who attend the event. The Isaac Young Chess Team finished 8th in the country at the National Scholastic Junior H.S. Chess championship tournament, they were back-to-back Connecticut state champions and Westchester County NY champions as well as New York State 2nd and 3rd place competition winners. More information on Tobey, images of the paintings and sculptures in the show, and his biography and artist's statement can be seen on his website at http://www.davidtobey.com, and he can be contacted at (914) 632-8226. "While creating my paintings, I intuitively deal with concepts in modern physics. In my abstractions, plasma-like bursts of energy describe primal power and speed. These are elements that are not visible to normal human senses in the stable structures of our empirical reality. "In the subatomic world of Quantum Mechanics only one of two possible variables can be measured at any given time: speed or location. I attempt to solve this dilemma with an expressive interpretation of speed through paint. I do this by instigating new measurement criteria in my works. Location is visually obvious but the painted gesture denotes as well as defines the rate and power of velocity. In my paintings speed is matter (paint) and matter is speed, thereby illustrating the commonality of matter and energy, and visually uniting cause and effect in Einsteinian theory and quantum thought. In painted movement, nature is determined by a roll of the dice, which is unacceptable to Einstein. "Color activates vibration, which in turn gives my abstractions life. A painting is a harmonious construction of different vibrations applied to the surface of a canvas. Through color, the viewer himself is able to vibrate in harmony with my work. "I instinctively stay away from the established use of collage. My use of shapes and objects becomes visions of mystery and subsequent discovery. Surface treatments on canvas, such as bulges, variations in thickness, and shaped objects under the paint are manipulated as if by a hidden force. The paintings’ compositions are determined by the cohesion of this force. All that exists is present in some dimension in the abstract concept: space/time. The all-important fourth dimension time glues elements together in a common bond with the micro and the macro universes. Representation of time in my paintings is accomplished by degrees of depth, by layering, and by linear unfolding of varied rhythms in the painted gestures. "My paintings can be fully experienced and understood by following the complicated undulations of the angles and curves in them; whereby motion can be literally felt by the viewer. This linear unfolding in time links my visual work with music, which is in reality the ultimate abstract art form. "My work explores the aesthetic between visual abstraction and music. There is an explicit connection between my paintings and the concepts of harmony, line, rhythm, shape, color, balance, and dynamics. Yet, the most important implicit connection in them is with the dimension of time. Time is experienced within the mind and body of the viewer. This synthesis of the two arts happens within this common denominator, time. David Tobey at Lincoln CenterArtist/Musician David Tobey seen at Lincoln Center in front of the poster for the Music Conservatory of Westchester's anniversary concert last year. The poster featured his painting "Exuberance", and David was also a guest conductor for part of the concert, which was at Alice Tully Hall. David Tobey's Welded Steel SculptureTobey's "Junk Yard Dog" is one of the welded steel sculptures that will be part of his exhibition. He does all of the fabrication work on his sculptures at LMC (Les Metalliers Champenois) foundry in Patterson, NJ; the international company that did the restoration of the Statue of Liberty Torch. David Tobey's"Bishop Takes Pawn" is the 3 x 4 foot acrylic painting that Tobey created especially for the National Scholastic Chess Foundation and donated to them for his event. 100% of the proceeds from an auction sale of the painting will go to benefit the NSCF, as well as 30% of all revenue from the sale of any other of his paintings or sculptures in the show during its run Nov. 7-25 at Pleiades Gallery in New York. Tobey'sThis Tobey original 2002 painting, "Fallen Angels 9/11", remembering the tragic destruction of the World Trade Center in 2001, is one of a dozen in his benefit one-man show for the National Scholastic Chess Foundation. A copy of this painting is in the permanent collection of the George Bush Library. David Tobey with some of his artworkArtist/Musician David Tobey holds one of his ceramics, "Secret Sound", standing beside his welded steel sculpture "Astrologist" and in front of his painting "Genesis". These are a few of his works of art that can be seen in his benefit one-man show for the National Scholastic Chess Foundation November 7-25, 2006 at Pleiades Gallery in New York City. Young NSCF Chess PlayersTwo young chess players from the Westchester School System, such as the two NSCF members seen above, will be present at the Tobey exhibition reception at Pleiades Gallery on Thursday, November 9th between 5:30 & 8:30 to challenge visitors to the exhibition and to demonstrate their skill. The NSCF is a not-for-profit organization that promotes the study of chess in the schools.